Wouldn’t it be wonderful if properties were handed down with a list of clear instructions, and everyone involved was on board with the same plan? Good luck finding yourself in that situation. Members of your family may feel sentimental about the property, especially if it was a childhood home. 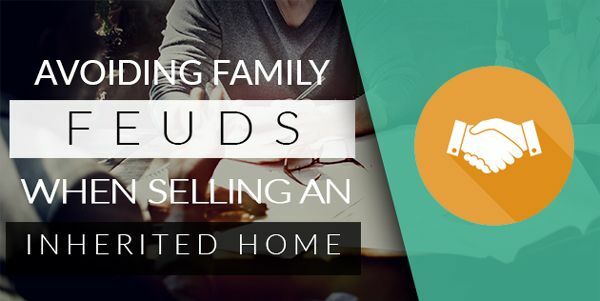 Selling is usually the most practical option.If family members are scattered everywhere and relocating is off the table, the inherited property is going to sit and collect dust while racking up a costly maintenance bill. The profits from a sale might benefit everyone financially. Maybe the property is in terrible shape, and repairing it is out of everyone’s league. Even if selling is the clearest decision, other members of your family may not see that. It can be difficult to feel like you’re the only level headed one, especially when everyone seems to disagree with you. Before you decide how to handle the property itself, you’re going to have to empty it out. Take advantage of this opportunity to set the right tone, and establish a pecking order. If the instructions left behind weren’t explicitly clear, set some ground rules. Take inventory of all the valued possessions, and let the adult children start picking first. Work down the list until everyone is mostly satisfied with what they have. Working together sets the right tone. If everyone feels involved and important, there’s no reason to shout. If you let things get chaotic now, they’re only going to stay chaotic when you approach the issue of selling the property. Wait for everyone to process what’s happened. If a loved one has recently died, that’s going to take an emotional toll on everyone. Give everyone time to grieve before you have the conversation about selling. There are two ways to approach this conversation. If you’re the sole inheritor, you may be in an awkward position. If you share the inheritance, you’re going to need to work together. If the property was handed directly to you, other family members may be upset about that. Consider how they feel. You might want to watch your tone. Be careful not to sound like you’re boasting. Be honest about why you want to sell. If you really need the money for your family, everyone will understand. If it’s an issue about maintenance costs or taxes you can’t afford, be up front about it. You aren’t the only one who gets to make the decision to sell the property if you share it with other family members. If everyone else agrees to sell, there’s no worries there – there isn’t much to do besides finding the value of the home and locating the right buyer. When people don’t agree, things get tricky. If you’re the only one on your side of the fence, things may be more difficult for you. If you can get others to see your point of view, you’re going to have better luck. Take a diplomatic approach to the conversation. Allow everyone involved to be heard, and say as much as they need to say. Don’t cut people off, jump in, and throw your opinions around as though yours are the most important. Empathy is very important at a time like this, and now is the time to show how capable of empathizing you really are. If others are looking to hold onto the property for sentimental reasons, you need to understand that while being prepared to explain that sentiment can become a burden when it comes to property. You should always have a selling plan. Since selling is your proposal, you need to make sure that all of your ducks are in a row before you start throwing around your ideas. You can’t expect others to do the work for you, so be clear that you intend to act as a leader through the selling process. Set the groundwork that you’ll be transparent throughout the entire process, and that everyone will have access to all information. This keeps you trustworthy. As with most estates, others involved may fear that you’re being motivated by greed. People who feel as though they weren’t left enough are going through a hard time – and you don’t know the way they’re handling their grief. They may even feel jealous that they weren’t named to inherit things. When other people are involved, you can’t expect to keep the entire profit from the sale of the property for yourself. It just won’t work that way. They’ll naturally be upset, because they loved the deceased person, too. Talk to everyone else about their concerns. If you have a sibling that’s desperately in need of a new vehicle or is struggling with a crippling debt, you also need to take their needs into account. If everyone can see that they’ll benefit from the sale of the home, they’re more likely to follow the plan that makes their lives easier. You’ll have much better luck getting things to move quickly if your family understands that you don’t intend to take off like a bandit and leave them all in the dust. Incorporate them into the selling process as far as they wish to be incorporated. Show everyone the value of the home on paper, and make sure they know the exact amount you’ve sold for. You’ll need to make good on all of your promises, and everyone needs to walk away feeling like they got their fair share.